"Remembering our Past, Embracing the Future" is the United States Mint’s theme this year for its 225th Anniversary. Living up to the theme, and for the first time ever, the Mint will release a commemorative gold coin depicting Lady Liberty as an African-American woman. The release date is April 6, 2017. The coin does not represent a specific historic figure in U.S. history, but it represents, acknowledges, and "remembers" black women in U.S. history. It also celebrates and "embraces" their past, current, and future contributions and successes as part of our Nation’s diverse community. The Black Lady Liberty commemorative gold coin has a face value set for $100, but is far more valuable to many who embrace this inclusive work of art. Elisa Basnight, U.S. Mint Chief of Staff, stated in the Washington Post, "We like to say at the Mint that our coins are the metallic footprints of our nation’s history, and symbolize what America values and honors." 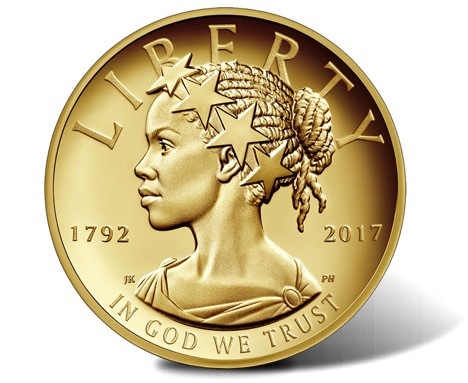 The coin’s head, designed by Brigham Young University Professor, painter, and illustrator Justin Kunz, shows a profile of a Black Lady Liberty with a crown of stars over her cornrowed hair. Beneath her shoulders is the familiar inscription, "In God We Trust." The reverse side shows an eagle in flight. According to the Salt Lake Tribune, Kunz said he wanted his Liberty to be "distinctive" and forward looking. The 2017 American Liberty 225th Anniversary Gold Coin is the first in a series of 24-karat gold coins that will feature designs that depict an allegorical Liberty in a variety of contemporary forms. These will include designs representing Asian-Americans, Hispanic-Americans, and Native-Americans among others to reflect the cultural and ethnic diversity of the United States. The Mint will issue the 24-karat gold coins every two years. The diversity and inclusion celebrated by the new gold coins reflect the diversity and inclusion across the NIH community – and around the world! For more information, see the United States Mint’s press release.